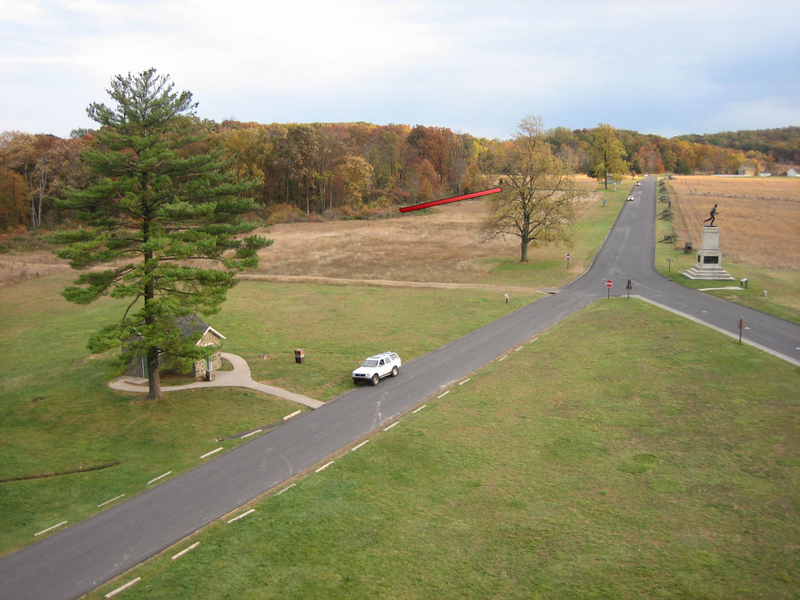 From the Pennsylvania monument, we show the earthworks that have been exposed by the tree cutting with a red line. We measured the earthworks to be approximately 130 yards long. The Pennsylvania Monument Restroom is to the left of the white car. The 1st Minnesota Monument is to the right of Hancock Avenue. This view was taken from the northwest facing southeast at approximately 5:00 PM on Wednesday, October 29, 2008. The Battlefield Rehabilitation, or Tree Cutting, occurring between Hancock Avenue and the Taneytown Road has exposed earthworks used by elements of the Third Army Corps or Caldwell’s Division of the Second Corps during the Battle of Gettysburg. 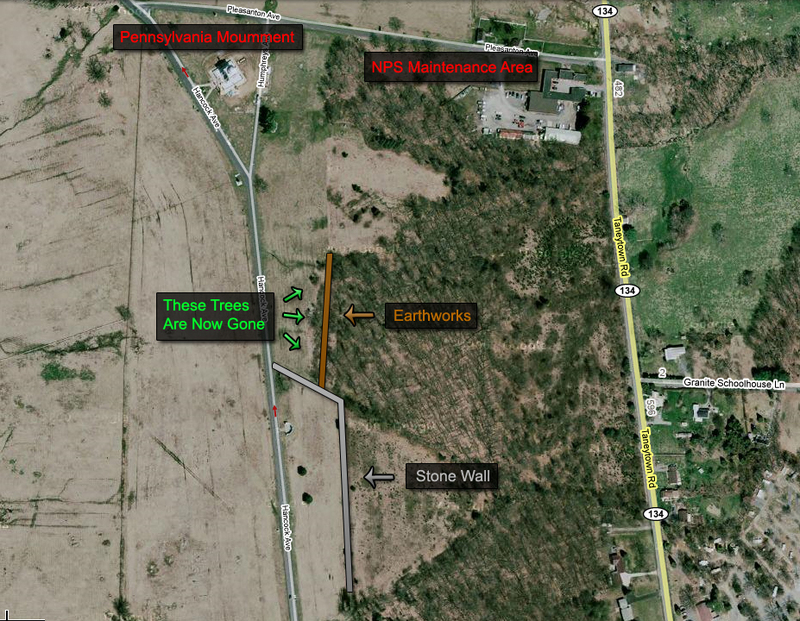 The earthworks had been hidden in the woods, and not too many individuals know about them. The cutting of the trees is bringing equipment in the area that is not only exposing, but in some cases damaging the earthworks. 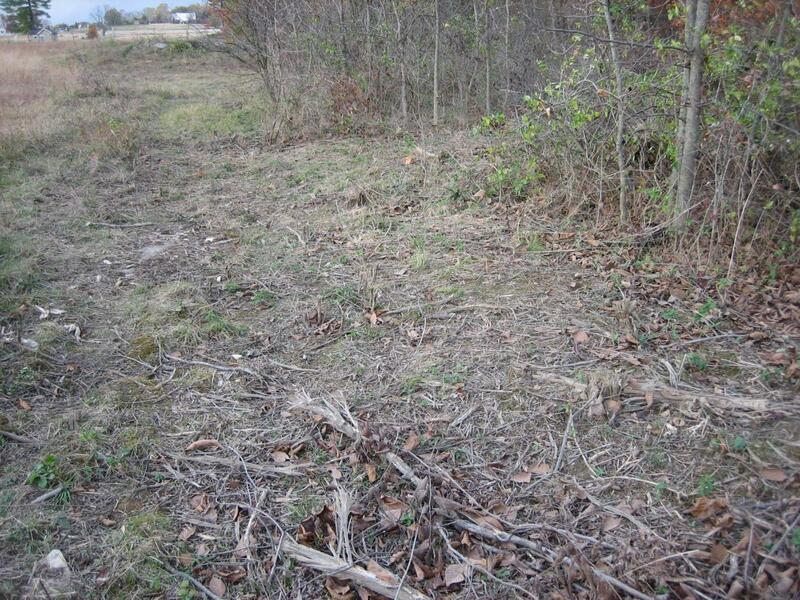 The concern is that the contractors cutting down the trees probably do not know that the earthworks are there. These earthworks were never part of the Civilian Conservation Corps (CCC) reconstruction/restoration/desecration (choose your favorite description) of other battlefield earthworks during the 1930s. These are the original earthworks, and sometimes they are difficult to pick out. 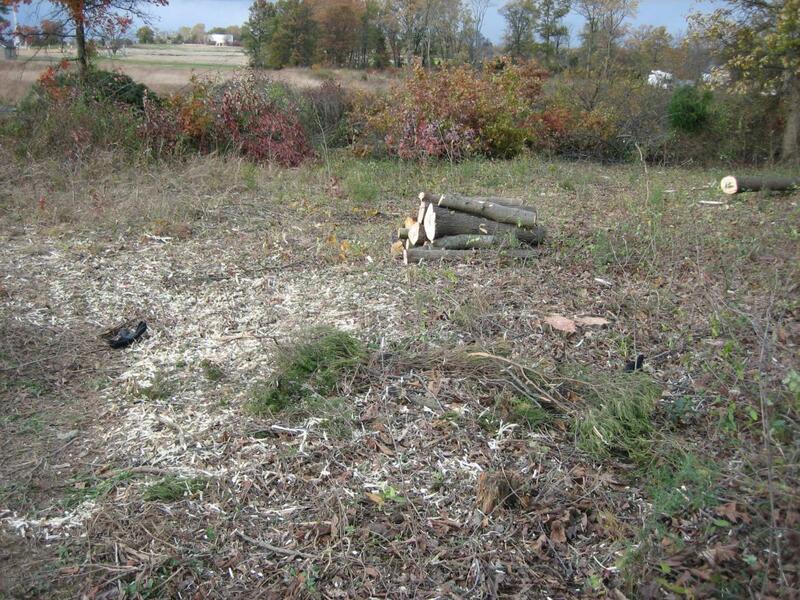 “Patterson Farm Tree Cutting Update” on October 17, 2008. 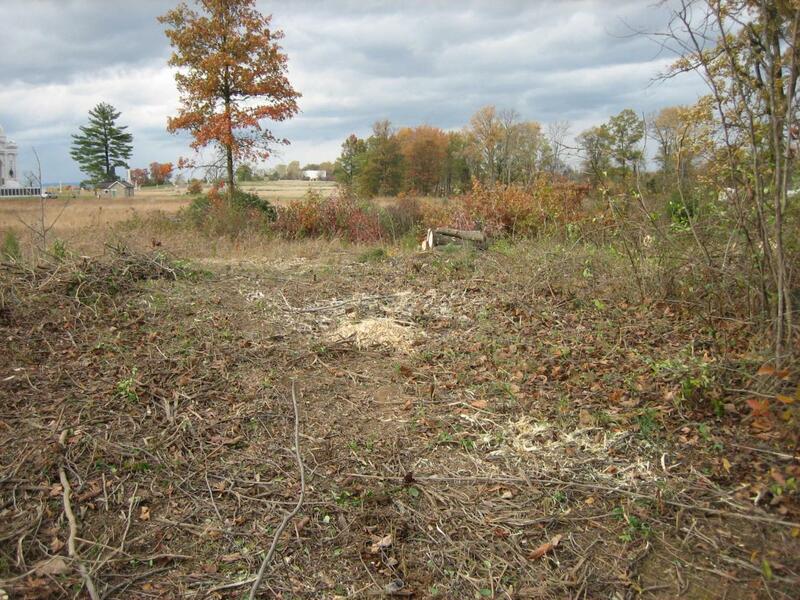 “Taneytown Road Battlefield Rehabilitation” on July 18, 2008. 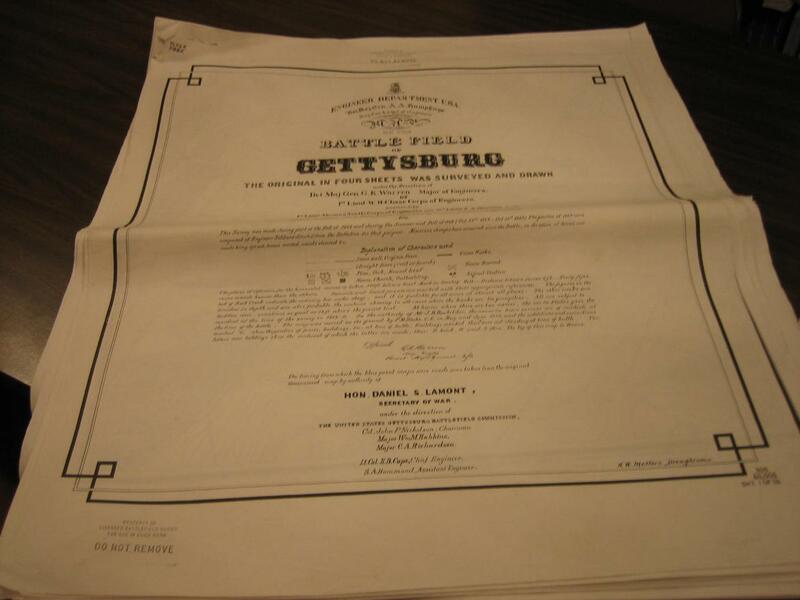 “Cemetery Ridge Rehabilitation Update” on August 9, 2008. 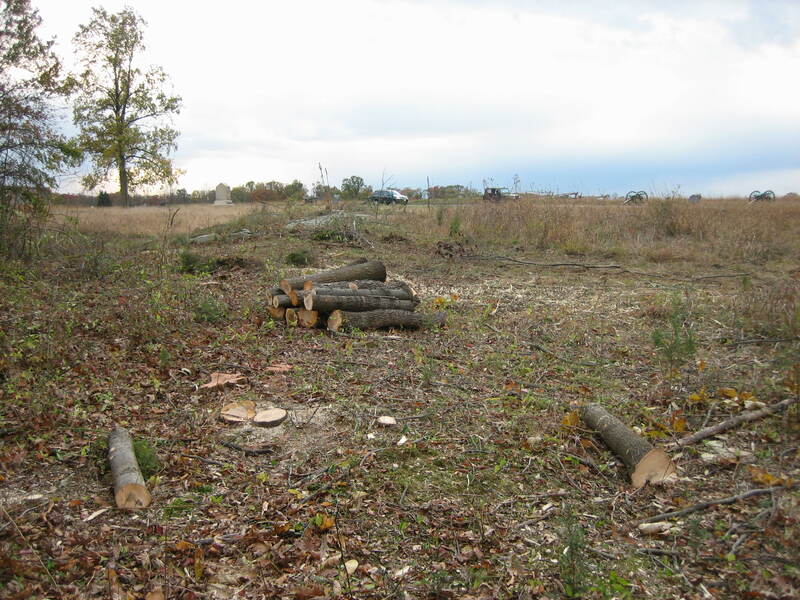 “Gettysburg Tree Cutting on East Side of Cemetery Ridge Covers a Large Area” on August 15, 2008. 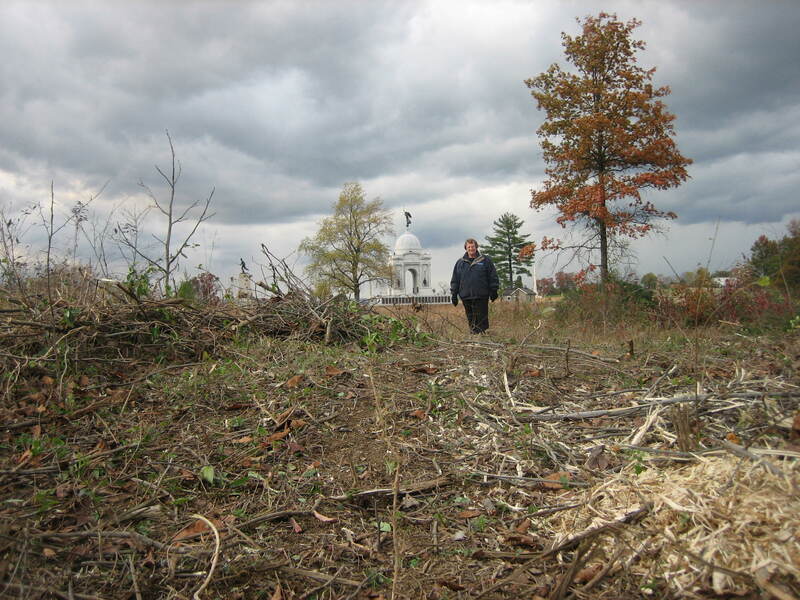 “Battlefield Rehabilitation Shows Subtleties of Cemetery Ridge Rehabilitation” on September 2, 2008. 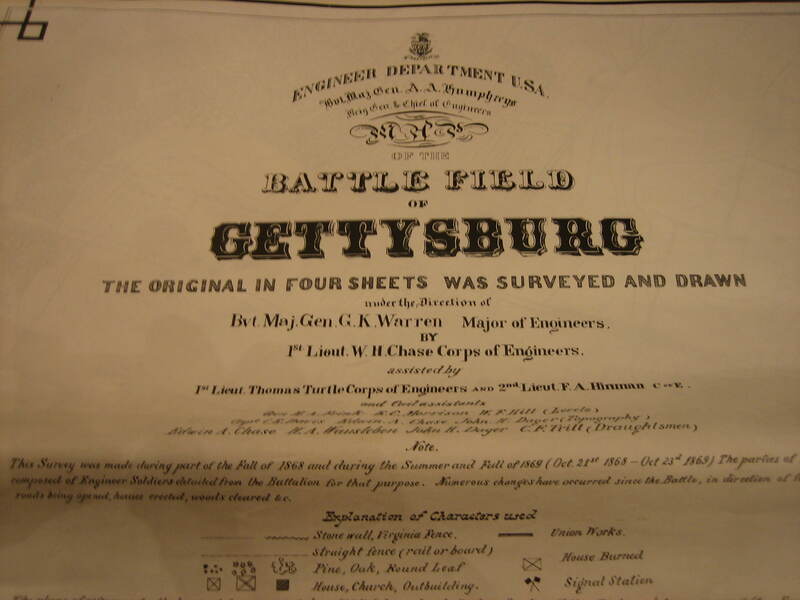 This map shows where the earthworks are located on Cemetery Ridge. This position was probably infantry support for McGilvery’s Artillery on the crest of Cemetery Ridge. 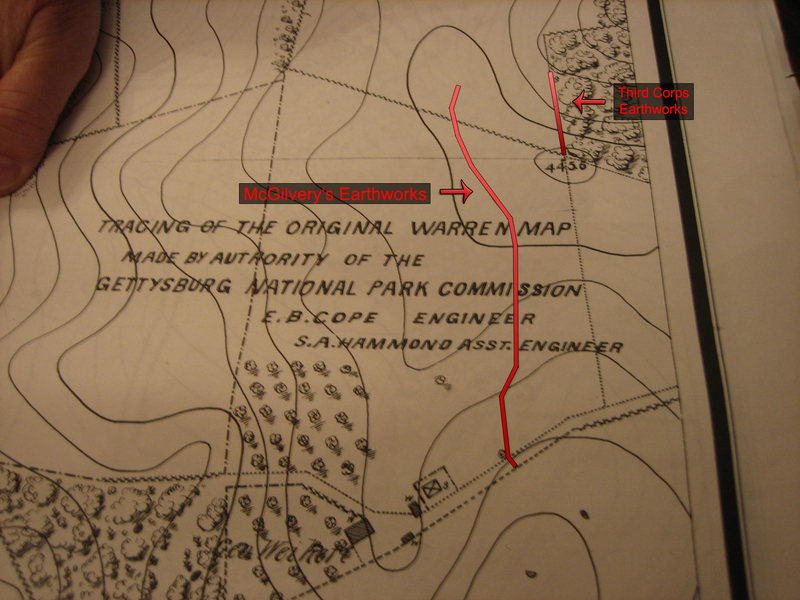 The earthworks are located approximately 100 yards behind McGilvery’s position. This map was created from the south facing north at approximately 9:00 PM on Wednesday, October 29, 2008. 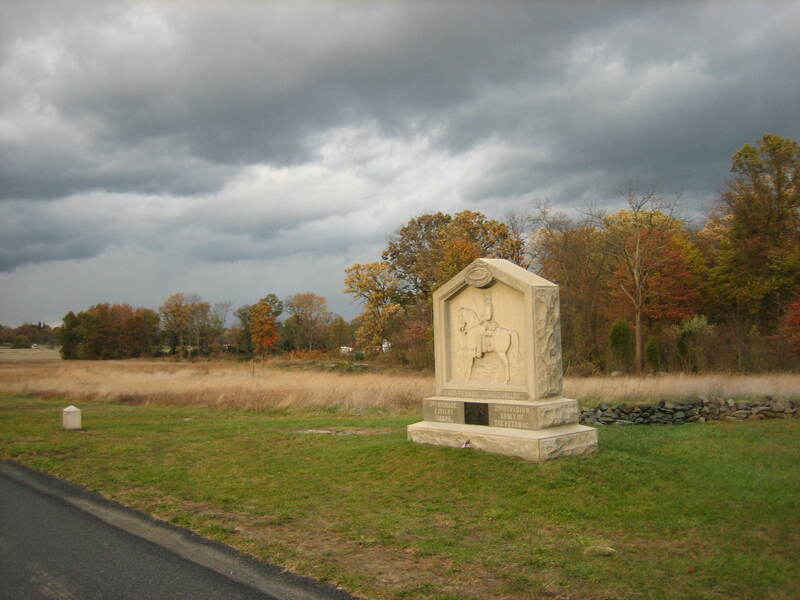 To get to the earthworks, drive north on Hancock Avenue and park near the 4th Pennsylvania Cavalry Monument. This view was taken from the southwest facing northeast at approximately 5:00 PM on Wednesday, October 29, 2008. 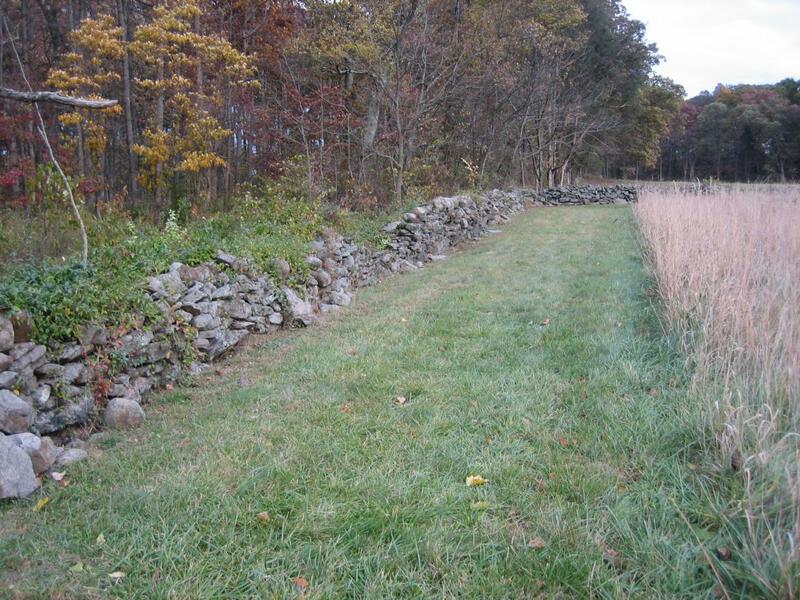 As you walk along a stone wall that extends towards Hancock Avenue running northwest to southeast, you’ll see where it meets a stone wall running north to south. This view was taken from the west facing east at approximately 5:00 PM on Wednesday, October 29, 2008. Let’s look at this from the left of (north of) the stone wall running northwest to southeast. There is a break in the wall. The earthworks start to the left of the break, in the brown bushes on the left. This view was taken from the northwest facing southeast at approximately 5:00 PM on Wednesday, October 29, 2008. Here they are. They are running from north to south, or left to right, where the grass meets the bushes and the trees. This view was taken from the west facing east at approximately 5:00 PM on Wednesday, October 29, 2008. We are taking a left and walking north with the earthworks on our right. We will walk in the area where a Bush Hog type vehicle has recently been operating. This view was taken from the south facing north at approximately 5:00 PM on Wednesday, October 29, 2008. Sometimes the earthworks are easy to pick out. Here we’ve put one glove on the bottom of the works and the other at the top to give one an idea of their depth in this area. This view was taken from the southwest facing northeast at approximately 5:00 PM on Wednesday, October 29, 2008. Other areas are difficult to pick out. 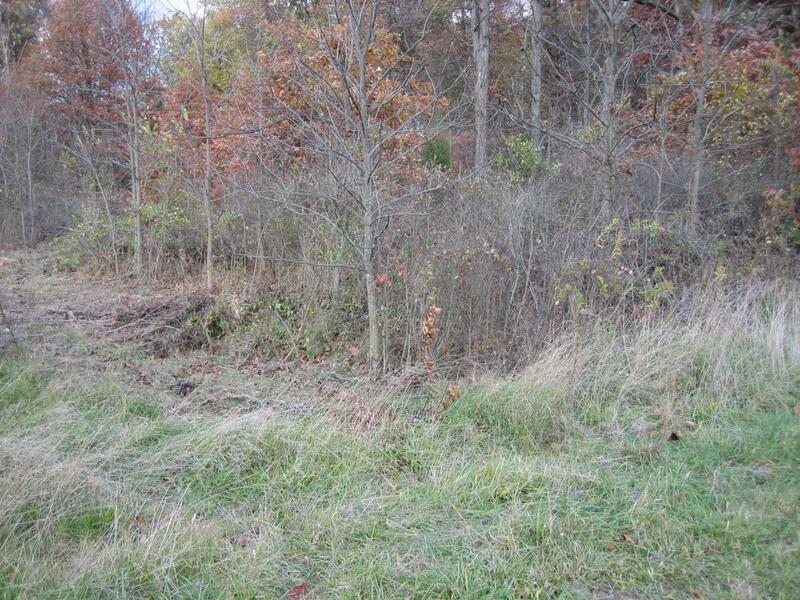 The earthworks are the lighter colored area running parallel to the woods, and close to the woods in this photo. The Cyclorama building is in the distance. This view was taken from the south facing north at approximately 5:00 PM on Wednesday, October 29, 2008. This tree stump is sitting directly on top of the earthworks. This view was taken from the south facing north at approximately 5:00 PM on Wednesday, October 29, 2008. In places the machinery has cut through the earthworks. This view was taken from the southwest facing northeast at approximately 5:00 PM on Wednesday, October 29, 2008. 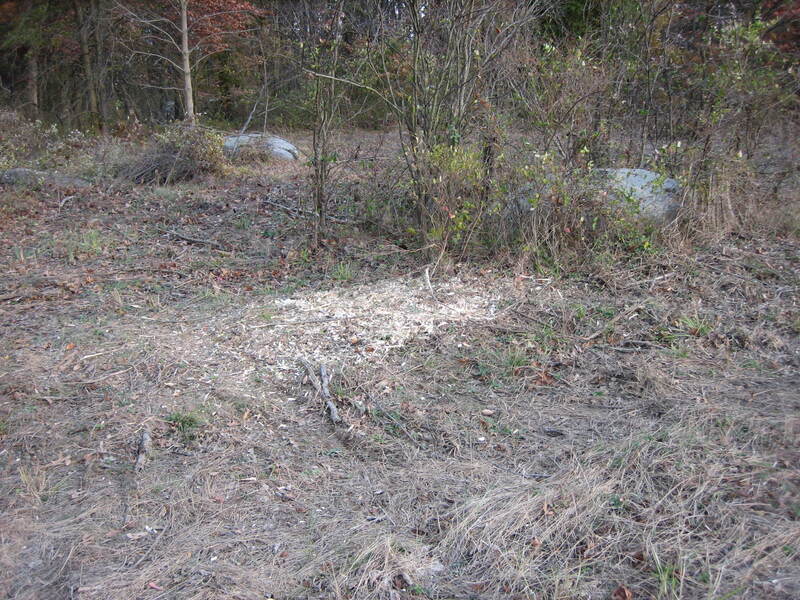 Here the light colored sawdust sits on top of the earthwork. This view was taken from the northwest facing southeast at approximately 5:00 PM on Wednesday, October 29, 2008. 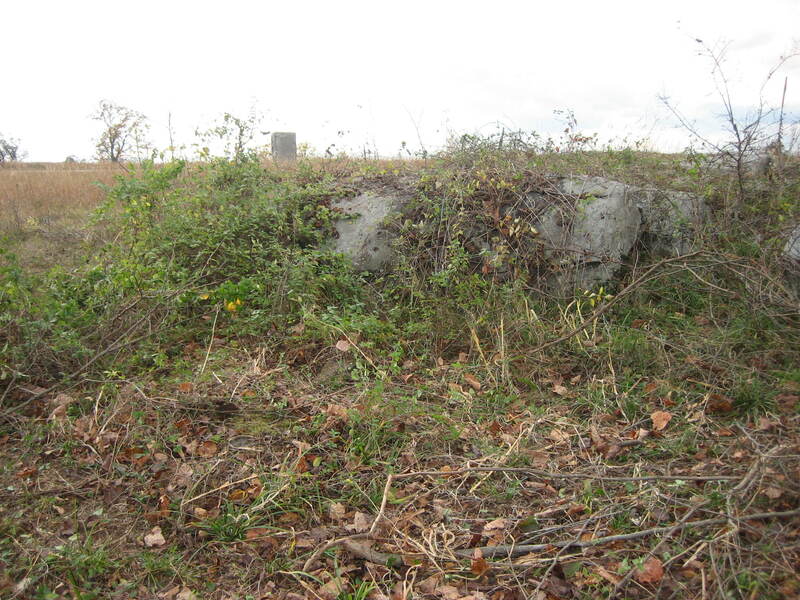 The soldiers incorporated rocks from the area into their fortifications. This view was taken from the southeast facing northwest at approximately 5:00 PM on Wednesday, October 29, 2008. This was also a good position because they were protected by the reverse slope of the ridge and their earthworks. 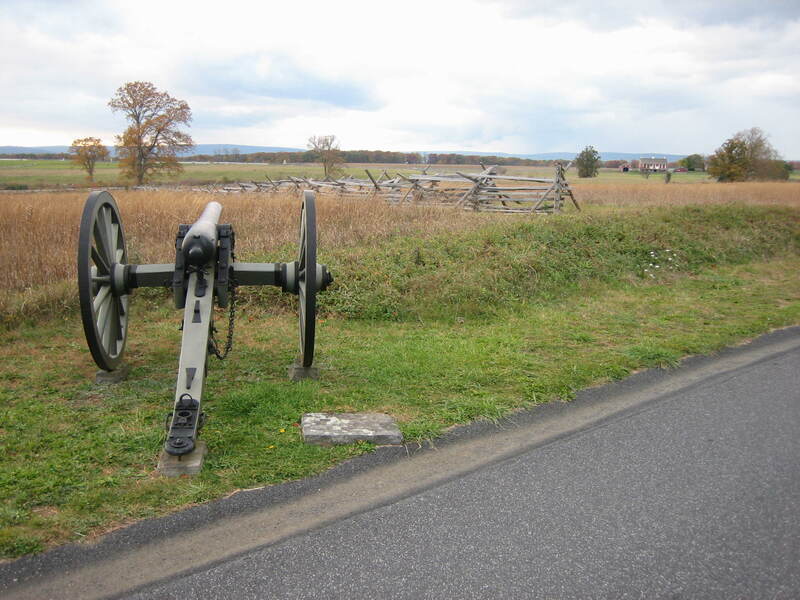 McGilvery’s Artillery line is marked by the cannon in the background. 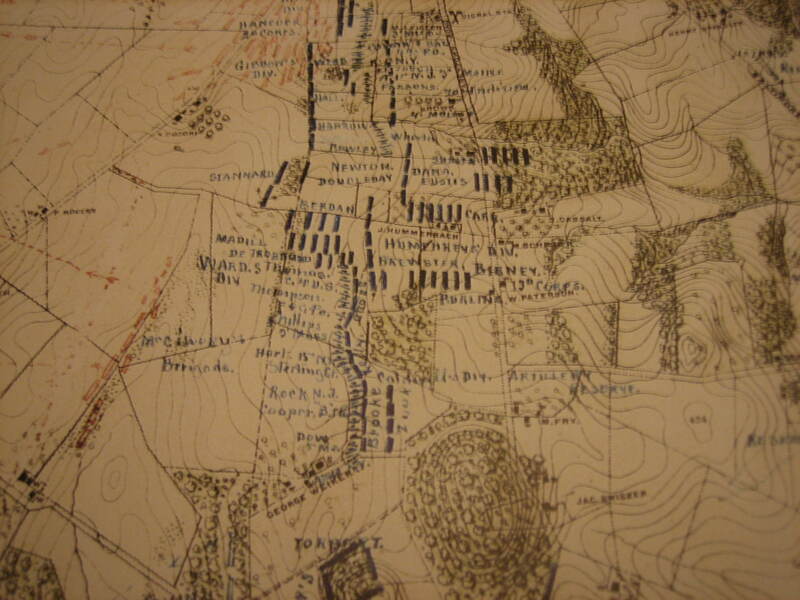 The earthworks, which probably protected the infantry support for the artillery are approximately 100 yards behind the artillery line. This view was taken from the east facing west at approximately 5:00 PM on Wednesday, October 29, 2008. The earthworks along McGilvery’s line, on what is now Hancock Avenue, were “reconstructed” by the Civilian Conservation Corps in the 1930s and are fairly prominent. 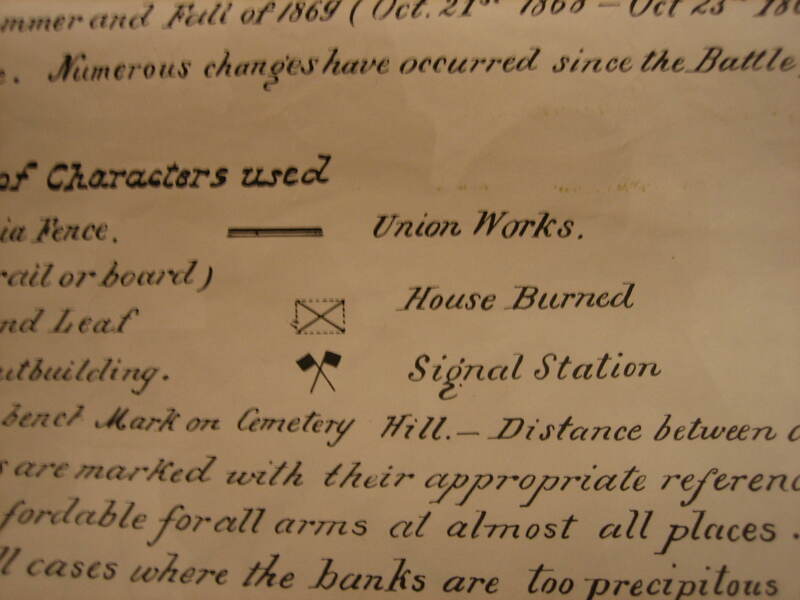 This is the position of Rank’s Battery. This view was taken from the southeast facing northwest at approximately 5:00 PM on Wednesday, October 29, 2008. 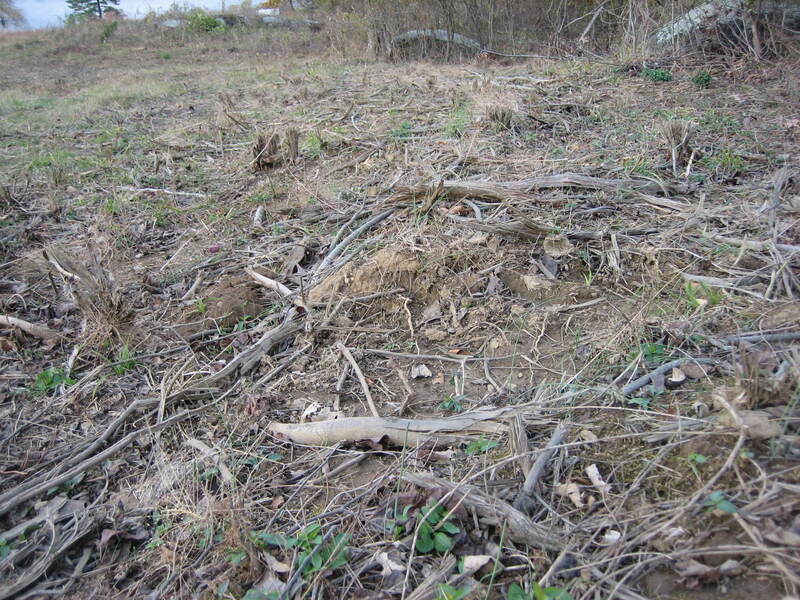 The earthworks run away from the camera in the sawdust, towards a small pile of wood. This view was taken from the south facing north at approximately 5:00 PM on Wednesday, October 29, 2008. 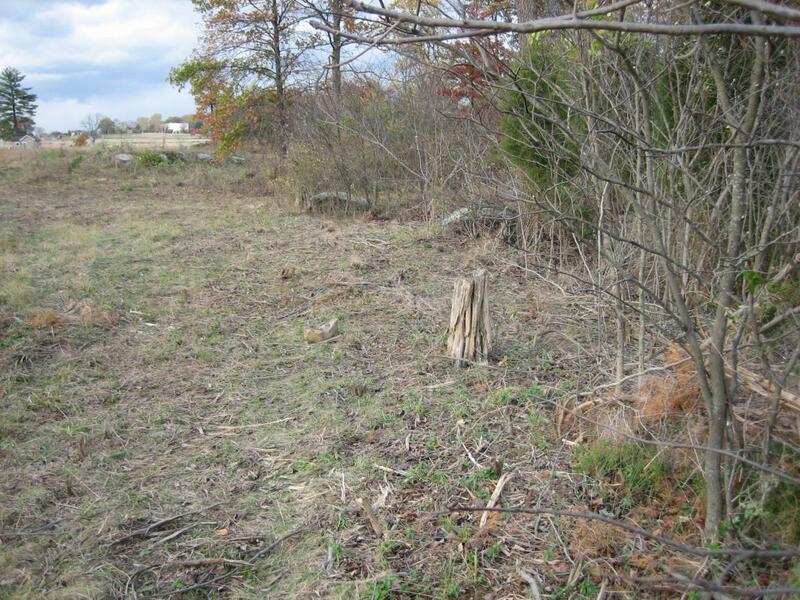 The woodpile sits right on top of the earthworks, and so is the person taking this photo. 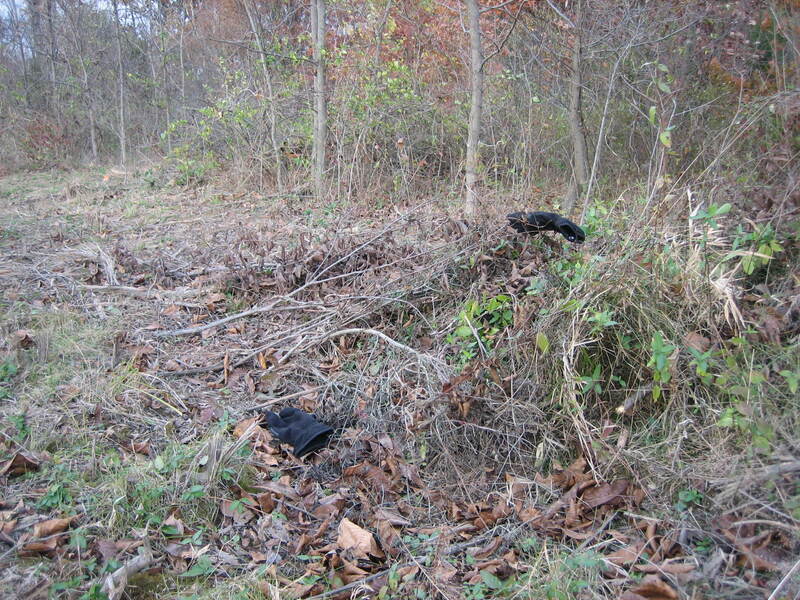 We have put our dark gloves on either side of the earthworks. This view was taken from the south facing north at approximately 5:00 PM on Wednesday, October 29, 2008. Here we will again attempt to give one an idea of where the earthworks are, and how wide they are. The woodpile is in the foreground. 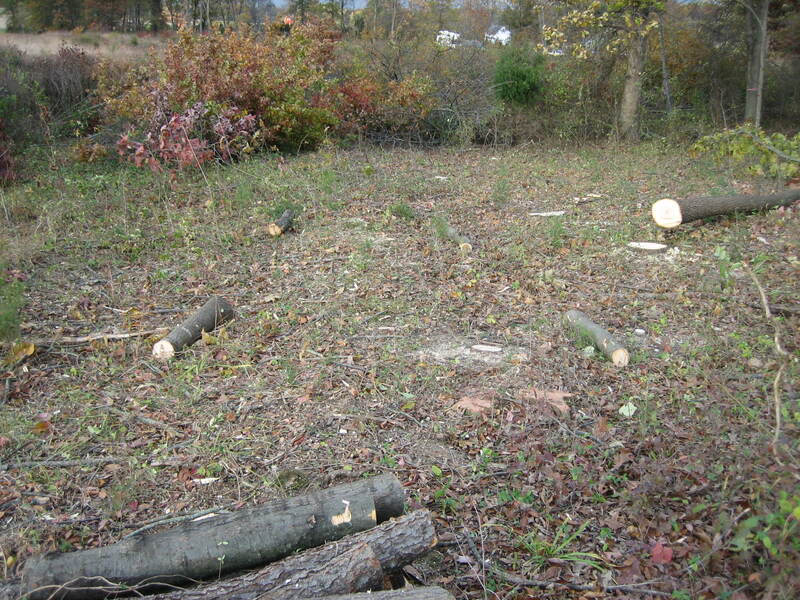 We have laid some pieces of the wood on either side of the earthworks. Here the works are six to seven feet wide. 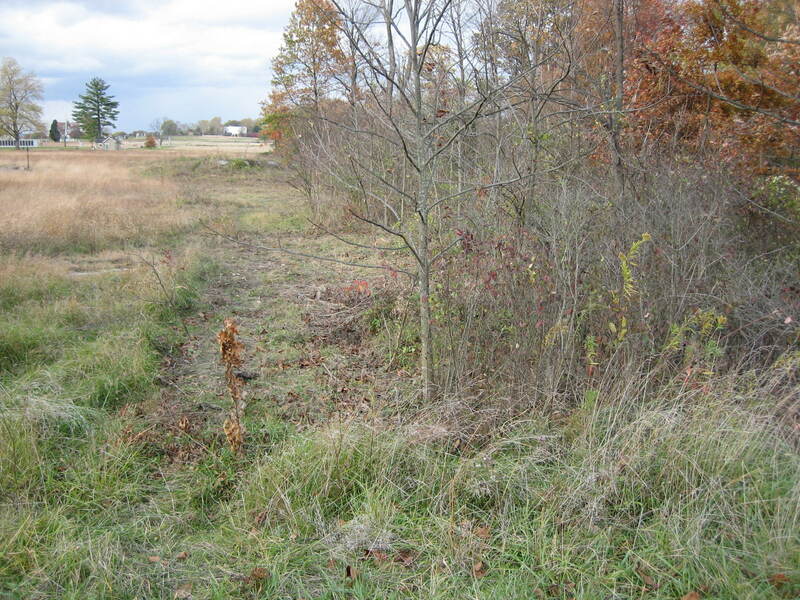 The earthworks disappear into the bushes. This view was taken from the southwest facing northeast at approximately 5:00 PM on Wednesday, October 29, 2008. We are looking over the earthworks towards the Pennsylvania Monument. We cannot see the feet of Licensed Battlefield Guide and earthworks defender Deb Novotny because the hump of the works hides them. This view was taken from the southeast facing northwest at approximately 5:00 PM on Wednesday, October 29, 2008. 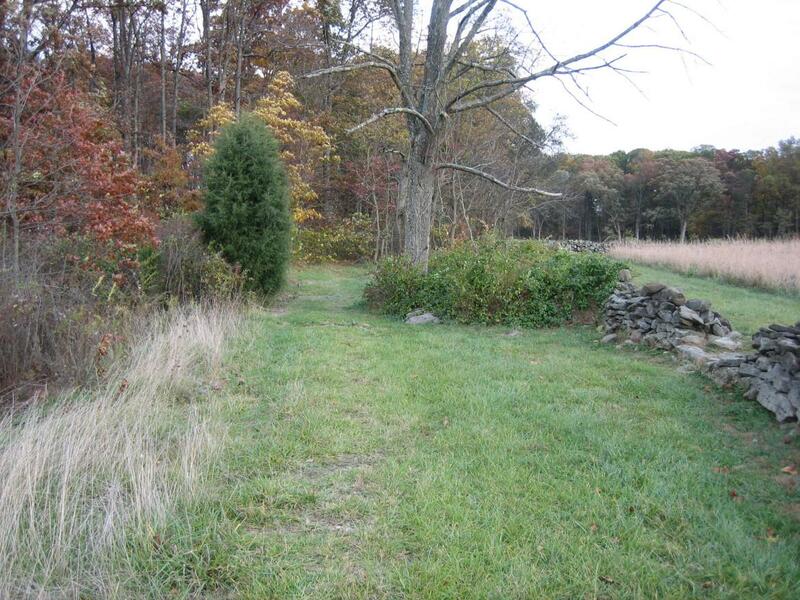 We are looking back along the line of earthworks towards the 4th Pennsylvania Cavalry Monument. This view was taken from the northeast facing southwest at approximately 5:00 PM on Wednesday, October 29, 2008. We wanted some documentation of the earthworks, and went to the Association of Licensed Battlefield Guides Room to look at the Warren Map. This view was taken in the guide room from the southeast facing northwest at approximately 5:00 PM on Wednesday, October 29, 2008. 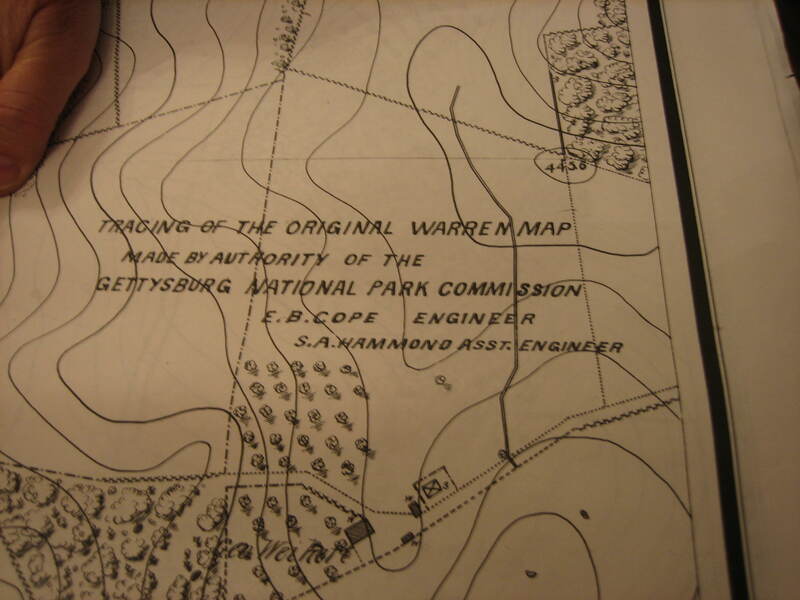 The Warren map, under the direction of Gouverneur K. Warren, was surveyed in 1868 and 1869. This view was taken from the south facing north at approximately 5:00 PM on Wednesday, October 29, 2008. 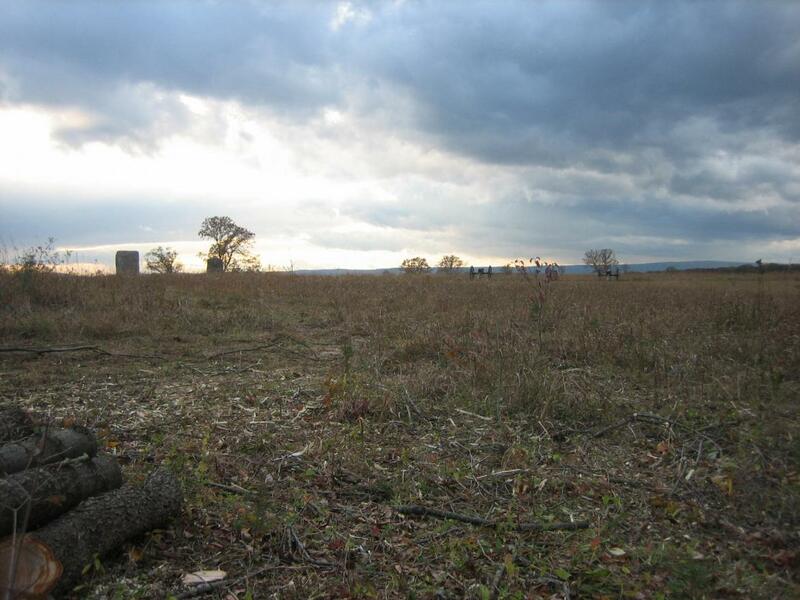 We wanted to look at the key to see what symbols were used for fences, stone walls, earthworks, etc… This view was taken from the south facing north at approximately 5:00 PM on Wednesday, October 29, 2008. Earthworks are marked by a solid line. This view was taken from the south facing north at approximately 5:00 PM on Wednesday, October 29, 2008. On map D-3, labeled Peach Orchard and Wheatfield, McGilvery’s Earthworks are shown, as are the works that are the subject of today’s post. This view was taken from the south facing north at approximately 5:00 PM on Wednesday, October 29, 2008. We are showing them to you with the works outlined in red. This view was taken from the south facing north at approximately 5:00 PM on Wednesday, October 29, 2008. 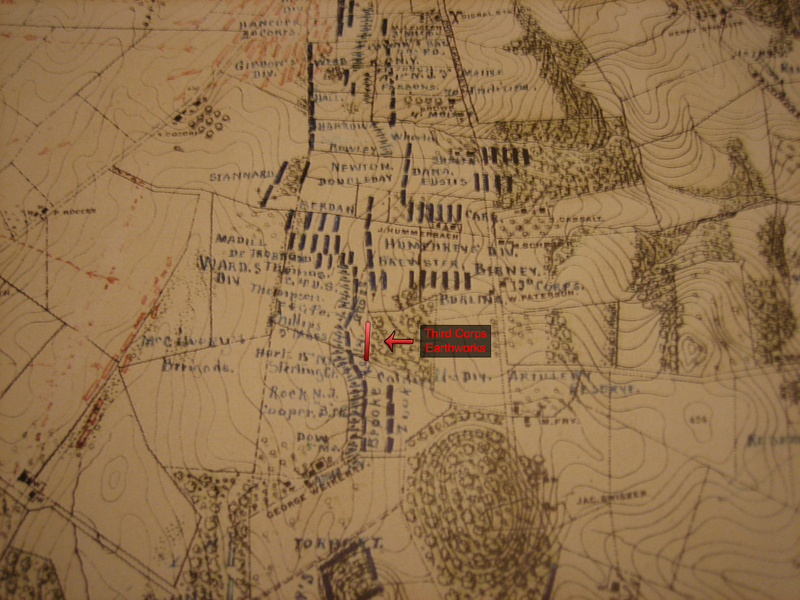 Historian John B. Bachelder’s map shows the closest infantry troops in this area as remnants of the Third Corps (labeled Birney) on July 3rd, and the remnants of Caldwell’s Division of the Second Corps. 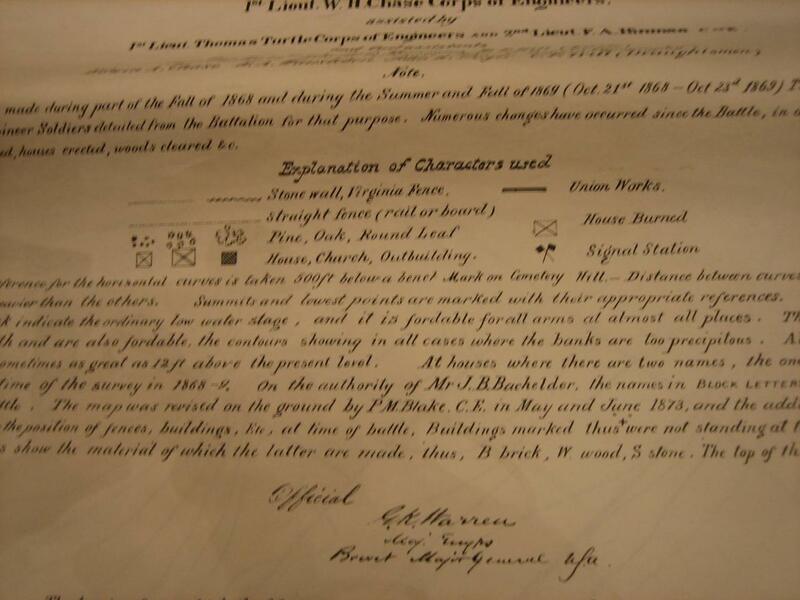 We have labeled the earthworks “Third Corps Earthworks” in the photo below, but we don’t know that with any certainty. This view was taken from the south facing north at approximately 5:00 PM on Wednesday, October 29, 2008. We have outlined the earthworks in red. This view was taken from the south facing north at approximately 5:00 PM on Wednesday, October 29, 2008.